This exceptional graphic novel recounts the spiritual odyssey of philosopher Bertrand Russell. In his agonized search for absolute truth, Russell crosses paths with legendary thinkers like Gottlob Frege, David Hilbert, and Kurt Gödel, and finds a passionate student in the great Ludwig Wittgenstein. But his most ambitious goal-to establish unshakable logical foundations of mathematics-continues to loom before him. Through love and hate, peace and war, Russell persists in the dogged mission that threatens to claim both his career and his personal happiness, finally driving him to the brink of insanity. This story is at the same time a historical novel and an accessible explication of some of the biggest ideas of mathematics and modern philosophy. With rich characterizations and expressive, atmospheric artwork, the book spins the pursuit of these ideas into a highly satisfying tale. Probing and ingeniously layered, the book throws light on Russell's inner struggles while setting them in the context of the timeless questions he spent his life trying to answer. 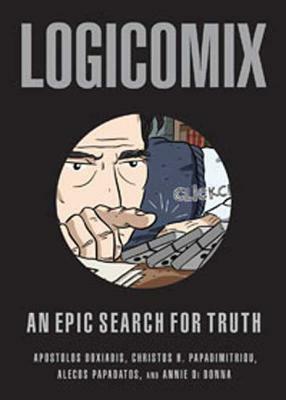 At its heart, Logicomix is a story about the conflict between an ideal rationality and the unchanging, flawed fabric of reality. Admitted to Columbia University at age 15, Apostolos Doxiadis has studied mathematics at both the undergraduate and graduate level. An internationally recognized expert on the subjects of mathematics and narrative, he has also worked in film and theater, and is the author of the international bestseller Uncle Petros and Goldbach's Conjecture. His personal website is www.apostolosdoxiadis.com. Christos Papadimitriou is a professor of Computer Science at Cal-Berkeley. He is the author of several books on computer science, as well as the novel Turing: A Novel about Computation.